After completing the very comprehensive and freely available Hartl Rails Tutorial, I decided to quickly put together a super simple Rails app to revise the basics. I mostly wanted to practice setting up a new Rails app and deploying it to Heroku. I could have done this with the standard Rails template application, but wanted it also to be something useful. 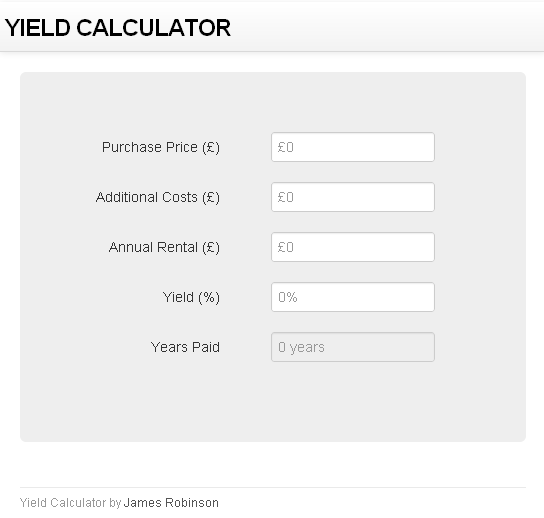 Over the course of a couple of hours last night (most of it spent rediscovering relevant commands in my notes, or Googling a weird bug) I created a Property Yield Calculator. It’s only a single static page, but it’s using a StaticPages controller rather than just delivering a pure HTML file. In the end I’m pleased with the result. It may be just a single static page, but I developed it from nothing in Rails and I’ve already found at least one person who finds it very useful.